An Impulse turbine, which is driven by a high-velocity jet (or multiple jets) of water. A Reaction turbine. The rotor of a reaction turbine is fully immersed in water and is enclosed in a pressure casing. The runner blades are profiled so that pressure differences across them impose lift forces, just as on aircraft wings, which cause the runner to rotate faster than is possible with a jet. A Gravity turbine is driven simply by the weight of water entering the top of the turbine and falling to the bottom, where it is released – for example, an overshot waterwheel. These are inherently slow-running machines. There are 3 main types of impulse turbine in use: the Pelton, the Turgo, and the Crossflow turbine. The two main types of reaction turbine are the propeller turbine (with Kaplan variant) and the Francis turbine. The reverse Archimedes Screw and the overshot waterwheel are both gravity turbines. The approximate ranges of head, flow and power applicable to the different turbine types are summarised in the chart of Figure 1 (up to 500kW power). These are approximate and depend on the precise design of each manufacturer. 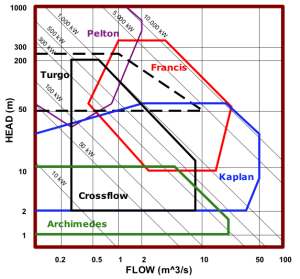 The diagram to the left shows the operating ranges for the Archimedes screw in comparison with other types of turbines in terms of head and flow rate. The principal types of turbine in use today. The Pelton Turbine consists of a wheel with a series of split buckets set around its rim; a high velocity jet of water is directed tangentially at the wheel. The jet hits each bucket and is split in half, so that each half is turned and deflected back almost through 180º. Nearly all the energy of the water goes into propelling the bucket and the deflected water falls into a discharge channel below. The Turgo turbine is similar to the Pelton but the jet strikes the plane of the runner at an angle (typically 20° to 25°) so that the water enters the runner on one side and exits on the other. Therefore the flow rate is not limited by the discharged fluid interfering with the incoming jet (as is the case with Pelton turbines). As a consequence, a Turgo turbine can have a smaller diameter runner and rotate faster than a Pelton for an equivalent flow rate. The Crossflow turbine has a drum-like rotor with a solid disk at each end and gutter-shaped “slats” joining the two disks. A jet of water enters the top of the rotor through the curved blades, emerging on the far side of the rotor by passing through the blades a 2nd time. The shape of the blades is such that on each passage through the periphery of the rotor the water transfers some of its momentum, before falling away with little residual energy. Reaction turbines exploit the oncoming flow of water to generate hydrodynamic lift forces to propel the runner blades. They are distinguished from the impulse type by having a runner that always functions within a completely water-filled casing. All reaction turbines have a diffuser known as a ‘draft tube’ below the runner through which the water discharges. The draft tube slows the discharged water and so creates suction below the runner which increases the effective head. Propeller-type turbines are similar in principle to the propeller of a ship, but operating in reversed mode. A set of inlet guide vanes admits the flow to the propeller and these are often adjustable so as to allow the flow passing through the machine to be varied. In some cases the blades of the runner can also be adjusted, in which case the turbine is called a Kaplan. The mechanics for adjusting turbine blades and guide vanes can be costly and tend to be more affordable for large systems, but can greatly improve efficiency over a wide range of flows. 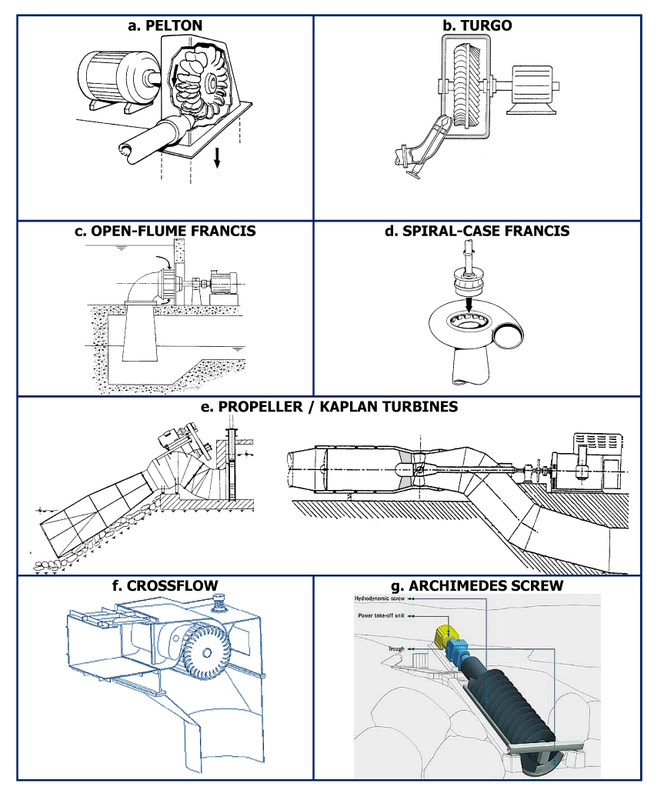 The Francis turbine is essentially a modified form of propeller turbine in which water flows radially inwards into the runner and is turned to emerge axially. For medium-head schemes, the runner is most commonly mounted in a spiral casing with internal adjustable guide vanes. Since the cross-flow turbine is now a less costly (though less efficient) alternative to the spiral-case Francis, it is rare for these turbines to be used on sites of less than 100 kW output. Pit-Francis. The Francis turbine was originally designed as a low-head machine, installed in an open chamber (or ‘pit’) without a spiral casing. Thousands of such machines were installed in the UK and the rest of Europe from the 1920s to the 1960s. Although an efficient turbine, it was eventually superseded by the propeller turbine which is more compact and faster-running for the same head and flow conditions. However, many of these ‘open-flume’ or ‘wall plate’ Francis turbines are still in place, hence this technology is still relevant for refurbishment schemes. The Archimedes Screw has been used as a pump for centuries, but has only recently been used in reverse as a turbine. It’s principle of operation is the same as the overshot waterwheel, but the clever shape of the helix allows the turbine to rotate faster than the equivalent waterwheel and with high efficiency of power conversion (over 80%). However they are still slow-running machines, which require a multi-stage gearbox to drive a standard generator. A key advantage of the Screw is that it avoids the need for a fine screen and automatic screen cleaner because most debris can pass safely through the turbine. The Archimedian screw is proven to be a ‘fish-friendly’ turbine. A water turbine running at a certain speed will draw a particular flow. If there is not sufficient flow in the river to meet this demand, the turbine could start to drain the river and its performance rapidly degrades. It therefore either has to shut down, or it has to change its internal geometry – a process known as regulation. Regulated turbines can move their inlet guide vanes and/or runner blades in order to increase or reduce the amount of flow they draw. The efficiency of the different turbines will inevitably reduce as they draw less flow. The typical variation is shown in below. Therefore a significant factor in the comparison of different turbine types is their relative efficiencies both at their design point and at reduced flows. For example, Pelton and Kaplan turbines retain very high efficiencies when running below design flow; whereas the efficiency of Crossflow and Francis turbines falls away more rapidly if run at below half their normal flow.